I know what you're thinking: Tofu sandwich? Gross. Right? Wrong! There are two tricks to getting the tofu to have the right texture and flavor here — they're so simple, you'd be crazy not to give it a try. Top with caramelized sweet onions and some Vegenaise to round out the flavors in the tofu and you've got one amazing hoagie. Do ahead: Remove tofu from package and drain water. Wrap tofu in plastic wrap and freeze overnight. Thaw prior to use — you can do this by letting it sit out for a few hours, or by thawing in the microwave. To start: Press the tofu to remove any extra moisture. Cut the thawed tofu block into about 1/4-inch thick slices and lay each slice on one end of a doubled-up kitchen towel. Fold the other end of the towel over the tofu slices and place something heavy on top (like a heavy teapot or frying pan). Let the tofu sit like that for 15 to 30 minutes, and remove from towel. In the meantime, prepare the marinade: Mix sesame oil, tamari, rice vinegar, sugar and red pepper flakes in a small bowl, until the sugar has dissolved. Marinate the tofu: Set the tofu steaks in a long, shallow tupperware container or baking dish. Pour the marinade over the tofu. Let rest for 30 minutes, moving around a bit after the first 15 minutes to ensure that every pice gets soaked (you don't need to marinate any longer — the frozen, thawed tofu will soak it up like a sponge). Fry the onions: Heat vegetable oil in a large frying pan over medium-high heat. Add the onions and stir to coat the onions with oil. Spread the onions out evenly in the pan and let cook for 10 minutes, stirring occasionally. Sprinkle onions with just a little bit of salt. Let cook for 30 minutes to an hour more, stirring every few minutes so the onions won't stick to the pan too much or burn. After the first 20 to 30 minutes you may want to lower the heat on the burner and add some more oil if the onions appear to be on the verge of burning. Continue to cook and stir/scrape until the onions are a rich brown color; remove from pan and set aside. Fry the tofu: Add the marinated tofu steaks to the same pan you fried the onions in, and fry for a few minutes on each side, until golden brown and just a tiny bit crispy — you may need to add a little more vegetable oil if the pan is too dry. Turn off the heat and remove tofu steaks from the pan. Prepare the sandwich: Spread Vegenaise on the top and bottom inside of your rolls. Lay a few tofu steaks over the Vegenaise on the bottom half of your rolls. Top with caramelized onions, cover with the top half of rolls and serve immediately while they're still warm. 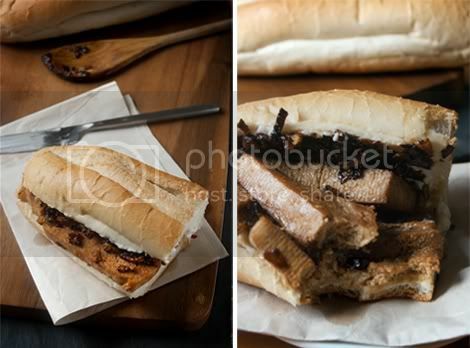 I actually really like tofu, so the thought of a tofu sandwich isn't off-putting at all! 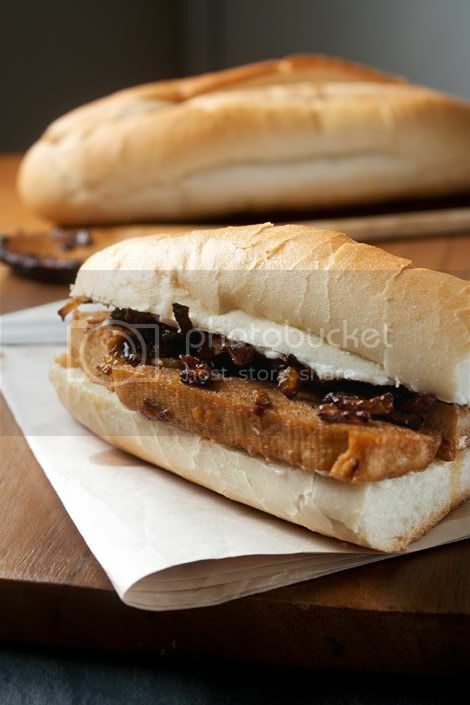 :) This sandwich looks and sounds so tasty, especially with the caramelized onions.